On December 2010 & January 2011, we hold Japanese Flower Show in Hong Kong and New York. These event were so wonderful, many floral buyers & designers have joined our events. Now we are aggressively promoting Japanese flowers in overseas countries and Japanese flowers are now expanding its market to USA, Asia, Europe and also Middle East. 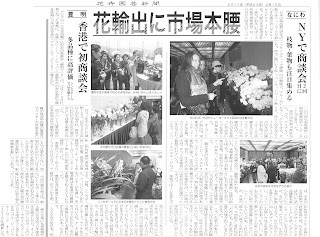 Our target this year is continue developing Japanese flower's market and expanding its export sales value to double amount.